I was on eBay the other day checking out stuff. You know you all do it. Anyway - in one of my searches it displayed an auction for Sergio Santos' update card. He was traded from the White Sox to the Blue Jays. So here he is in Jay blue. Man....that card looks really familiar. 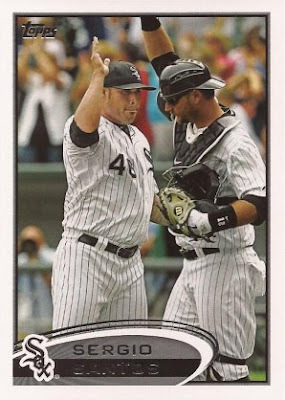 Let's grab his 2012 Topps Series 1 card in ChiSox black. 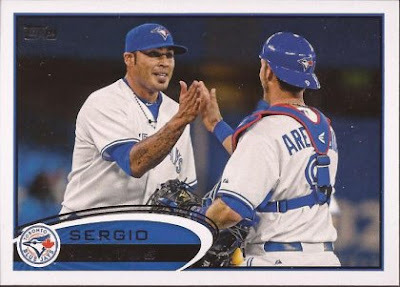 So I guess in the Topps world, Sergio really isn't a good pitcher, but can he has mad skillz to high five his battery mate. Labels: Topps, Update, what the?